then, a simple transfer will do. then, you don't need any fuel. Mankind currently orbits to other planets. It takes no fuel, but it takes a while. G-force propulsion will be much quicker. It will take some fuel. For convenience, Thought Experiment (TE) assumes circular orbits. 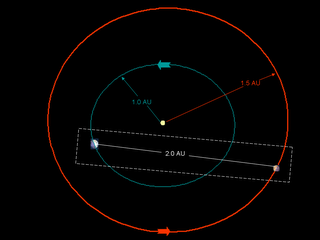 Each planetary destination has an observed semimajor axis (a) and period (T). "a" can be expressed in astronomical units (AUs), meters and kilometers. Orbital period, T, can be expressed in seconds and years. Orbital velocity, v, can be expressed in kilometers per second (kps). is the product of the gravitational constant and the mass of a relevant dominant astronomical body. If this body is the Sun, it may also be called the heliocentric gravitational constant (μ☉). 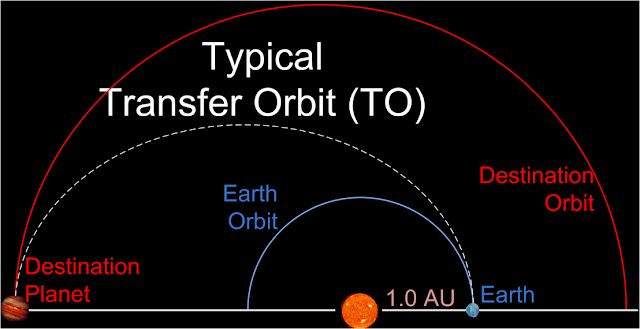 To determine a typical duration for current technology to travel between planets, Thought Experiment (TE) will briefly consider Transfer Orbits (TOs). 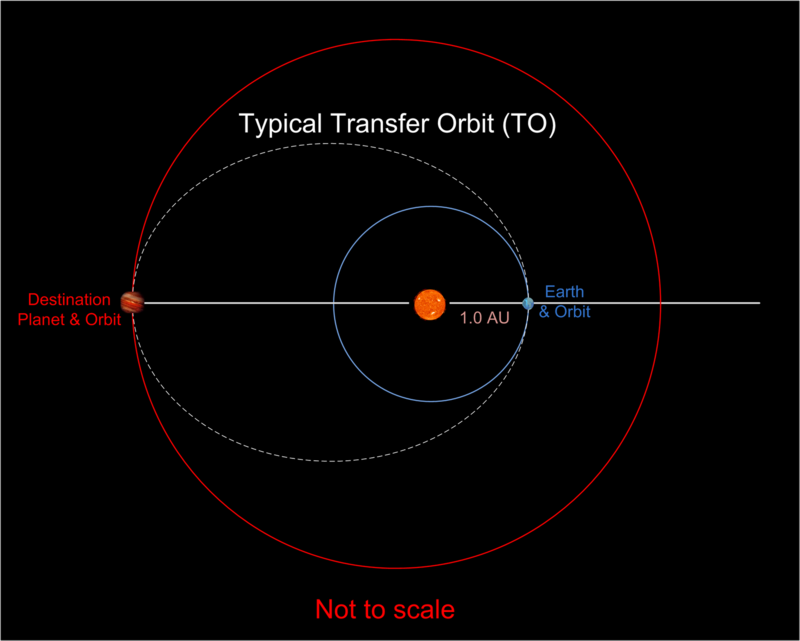 Mankind currently uses transfer orbits for their infrequent interplanetary flights. During TOs, space vehicles don't use propulsion for most of the trip. but they don't need much fuel. 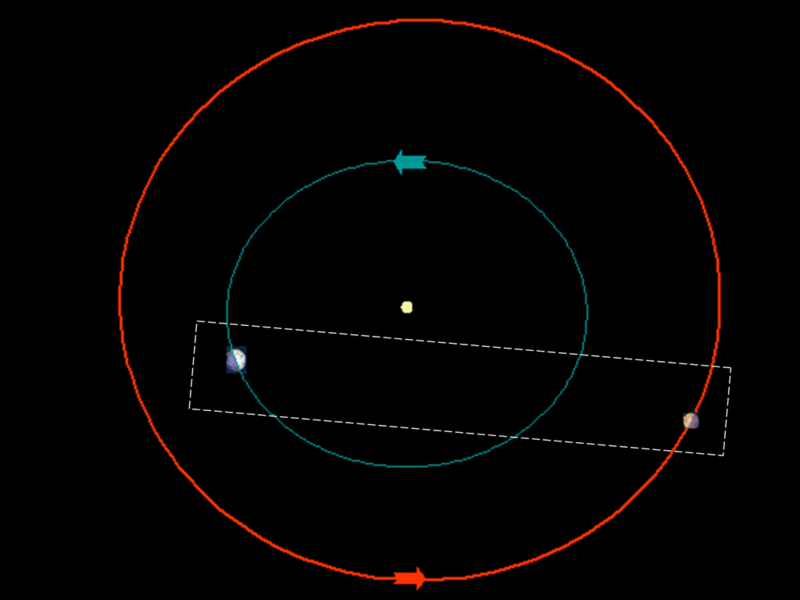 As a matter of fact, an optimum orbit transfer can get by with only two short engine impulses to shift a spacecraft from one orbit to another. TE focuses on transfers from Earth’s orbit to outer planet orbits. For convenience, TE assumes all planetary orbits to be circular and co-planar. Typical TO leverages the Sun's gravity to achieve an extremely elliptical orbit with Sol as a focus. TE assumes one fuel burn at the perihelion (closest distance from Sol) to achieve required TO. 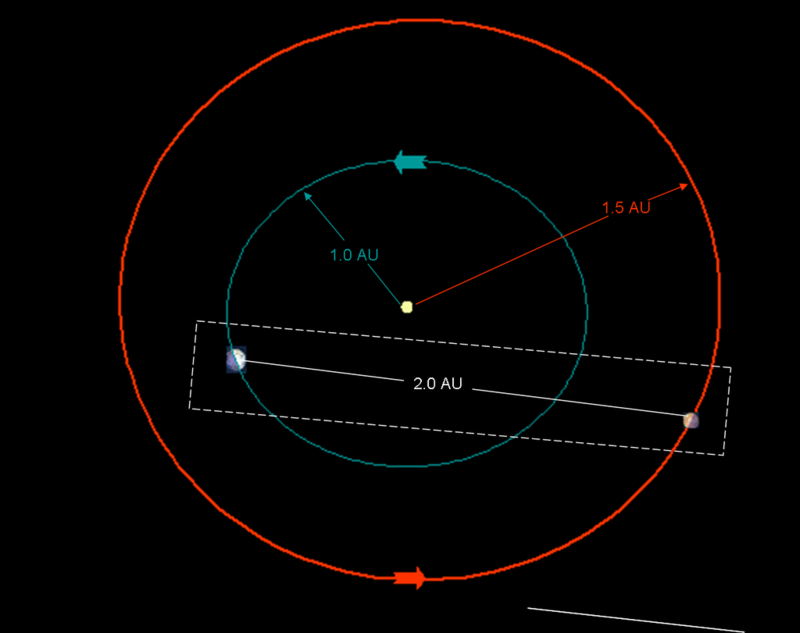 TE assumes another short burst at aphelion (farthest distance from Sol) to join the destination orbit. Hohmann Transfer (HT) is a special case TO; it is considered to be the most fuel efficient. TE uses HT model to conveniently compute some typical TO durations. Furthermore, TE uses some assumptions to further simplify this process. These are discussed later in this chapter. TE settles on HT for "typical transfer times". For more on orbits and on HTs, see book, Orbital Motions, by A. E. Roy. Assume planetary orbits to be circular. **Assume ships depart Earth's orbit with radius of 1 AU. Semimajor axis, aD, of destination orbit is observed. TO eccentricity [eTO = (aD-1)/(aD+1)] per formula (12.3) on page 355, Orbital Motion by A. E. Roy. Transfer Time (tTO) is half of TO period (√(a3)). Transfer Orbit (TO) is the highly elliptical orbit which connects orbit of Earth with orbit of destination planet. TO period is the time needed for space vessel to depart orbit of Earth, go to orbit of destination planet; then, return to orbit of Earth. Of course, only half this time is needed to transit from Earth orbit to destination orbit (Transfer Time). TO semimajor axis, [aTO = (aD+1)/2] is average of Earth's a (1.0 AU) and aD, destination semimajor axis. TO semiminor axis, bTO , is computed via a common elliptical identity. thus, speed changes determine transfer orbits which change from orbit to orbit. AVERAGE VELOCITY (VAve): TE determines average velocity by dividing transfer distance (dτ) by transfer time (tτ). 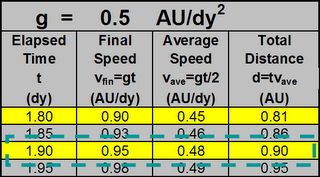 Subsequent velocities, minimum (vmin) and maximum (vmax) are determined in a different way. Vis-Viva Equation can determine object's orbital velocity at any point in the orbit. Transfer Orbit's semimajor axis aτ is constant for that orbit. Radius vector distance (rτ) is the Independent variable (IV), and associated velocity vτ is the Dependent Variable. Minimum Velocity happens at TO's farthest point from Sun (aphelion, Qτ). 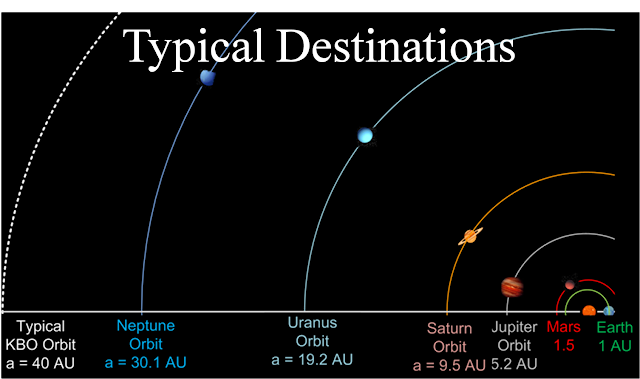 Each TO aphelion is semi-major axis of destination orbit (aDest). Maximum Velocity happens at TO's closest point to Sun (perihelion, qT). Since these TOs use Earth's orbit to depart for outer planets, the aphelion will always be 1 AU, the semimajor axis of Earth's orbit. CONCLUSION: TO velocity is everchanging due to its highly elliptical shape. Velocity depends on distance from Sol which changes as object changes orbital position. Thus, object is at maximum velocity at orbit's perihelion, which happens to be at Earth's orbit (1 AU) as object departs for orbits of outer planets. Object velocity continually decreases until it reaches orbit's aphelion at orbit of destination planet at which point, object will be at minimum speed. Second fuel burn occurs when the spacecraft reaches its destination orbit; it changes orbital speed (and hence its orbital shape) to achieve the larger circular orbit. To actually orbit the planet, the spacecraft will have to decelerate again and allow planet's gravity to capture it. From start to stop, typical TO speed (see Table 3) takes a long trip to travel the vast distance in one half of the transfer orbit. Typical transfer times can be shown as years (see Table 2). A long time to endure zero g.
Thus far, we've established that relatively small amounts of thrust at either end of the trip are all that are needed to arrange the transfer. Not much fuel, but even the best planned, luckiest TO ever (where everything goes exactly right, a rare event) will take many months, a long time in lonely space at zero g.
Launch Window. Thus far, TE has only considered the duration of transfers between the orbits of destination planets. For spacecraft to actually arrive at the planet itself, fuel efficiency requires the departure from Earth's orbit to wait until the two planets are properly aligned. Departure time must be planned so the destination planet and the spacecraft will arrive at the same point at the same time. Thus, flight planers must determine a transfer orbit to intersect the destination orbit, and they must also carefully plan the timing of this intersection. Thus, Transfer Orbit to interplanetary destination is not practical for anything other then infrequent scientific experiments conducted by Artificially Intelligent (AI) devices. Their life support requirements are not as rigorous as humans; they don't need a social life. 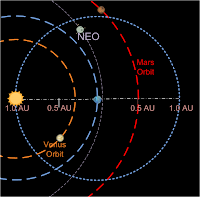 Above diagram shows a rough sketch of Earth and Mars in their respective orbits around Sol. 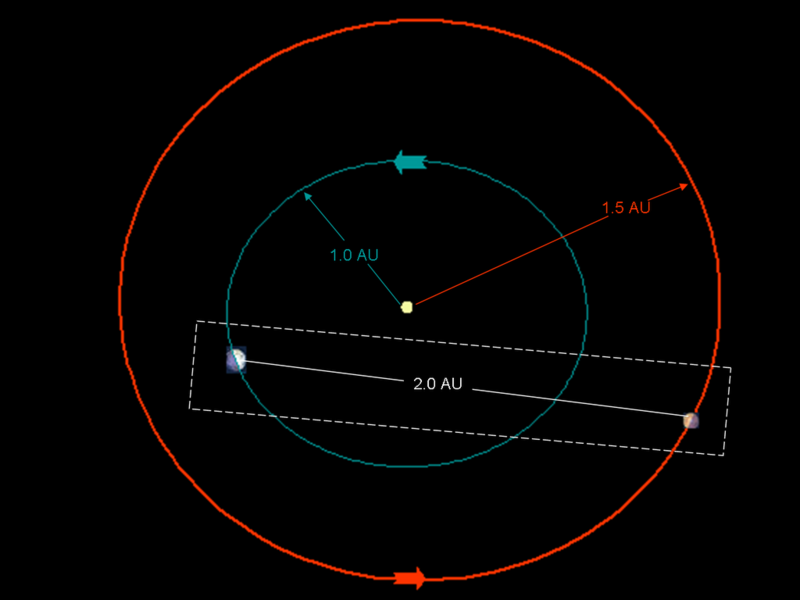 Assume planets to be in relative positions shown and that distance between them happens to be 2.0 AU at this time. 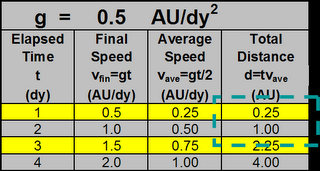 Assume velocity at beginning of trip is zero (disregard speed due to orbital manuevers). Problem: Determine velocity of spaceship at midway, after traveling a distance of 1.0 AU (assume 1 AU = 150,000,000 kilometers = 150,000 megameters). If we get the same answer by solving this problem in two different ways, that increases our confidence in the solution. Thus, we'll solve this problem in two ways, simple and simpler. SIMPLE WAY. Build tables. Previous blentries are full of tables; so, following tables will be brief. Since 60 secs = 1 min and 1 sec = 1 min/60 (one sixtieth of a min), we can readily convert last entry of above table, and determine that after accelerating for one min at rate, g, our final velocity has reached 600 meters per 1min/60 or 36,000 m/min = 36 km/min. Since 60 mins = 1 hr and 1 min = 1 hr/60 (one sixtieth of an hr), we can readily convert last entry of above table, and determine that after accelerating for one hr at rate, g, our final velocity has reached 2,160 kms per 1hr/60 or 129,600 km/hr = about 130 Megameter (Mm)/hr. Since 24 hrs = 1 day and 1 hr = 1 day/24, we can readily convert last entry of above table, and determine that after accelerating for one day at rate, g, our final velocity has reached 3120 Mms per 1day/24 or 74,880 Mm/day = about .5 AU/day. 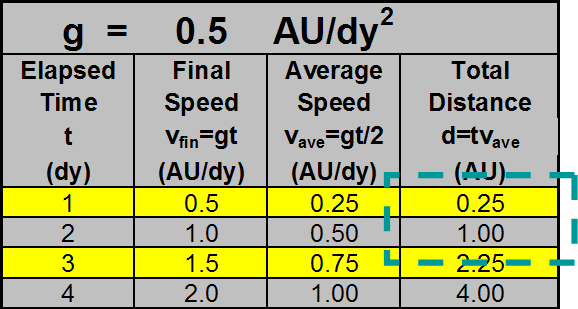 Since we've determined that accelerating at g will increase our velocity to .5 AU per day after first day's travel, let's take the leap and assume that 10 m/sec**2 = g = .5 AU/day**2. This should be very convenient because interplanetary distances can be easily expressed in AUs. Since spaceship started at rest and consistently increased speed throughout the trip, we can easily determine average velocity by dividing final velocity by two. Knowing average velocity, we can apply familiar distance = time * ave-velocity to determine distance traveled. Fortunately, distance to midpoint (1.0 AU) happens to fall on our table; thus, we can solve this problem by noting that after traveling 1.0 AUs at acceleration, g (= 10 m/s/s/), we've acheived a final velocity of 1.0 AU per day. However, recall this velocity equals 3,120,000 kms/hour. Since a typical orbital velocity for Early is about 50,000 kms/hour; we have to start SLOWING DOWN in order to orbit around Mars, our destination. NOTE that above problem solving method was very simple, but time consuming with many opportunities for human error. Next method is simpler but less intuitive. This will be discussed in next blentry, Problem-2.Previous problem (P-1) requested the value for final velocity at midpoint of notional space flight from Earth to Mars. Interesting exercise, but the point is that after constantly increasing velocity at acceleration, g; the midpoint velocity is very high. Thus, we must be able to determine midpoint, because we must SLOW DOWN exactly at midpoint (or adjust some flight parameters, more on that in future blog entries.) Thus, knowing the exact time to start slowing down is even more important then knowing current velocity. During the solution of problem-1, we needed to determine travel time required to accelerate (at g) to 1.0 AU (150 million kms). Solution used simple equations to build table to determine distances for even increments of travel time (days). Conveniently, 1.0 AU happened to be one of the values in the Distance column. What if the distance was not on the table? For example, following diagram shows another flight profile with 0.9 AU to the midpoint. Problem-2 requests the travel time to accelerate, g, to 0.9 AU. Well, the table doesn't have a row corresponding to 0.9 AU, but we can get some utility out of what's there. --Since 0.9 is much closer to 1.0 AU then to 0.25 AU, we might speculate the corresponding travel time to be closer to 2 days. Sure enough, by arbitrarily chosing a range of 1.8 to 1.95 days with .05 increments, we happen to find that traveling at 1.90 days will take us to .9 AUs. Consider a couple of cosmetic factors. 1. Most people are not now comfortable using decimal days to measure time. Transitioning to a more comfortable utility level can be accomplished in several ways. Perhaps another table would help. Thus, we can easily determine that after traveling for one day, 21 hours and 36 mins, we have reached our midpoint of .9 AU, and we should start slowing down. Why? That takes us to our second cosmetic factor. 2. An AU per day appears to be a small, simple quantity, but it is an enormous speed, and 0.95 AU per day is just a little slower. While we could build yet another table, let's just do some simple math. We must reduce this speed to a velocity which will allow our spacecraft to orbit around Mars. which tells us that Mars orbital velocity is 24.13 km/sec. I compute this to 86,868 km/hr which I'll round to 87,000 km per hr. This equates to a very small fraction of 1 AU per day (24 * 87,000/150,000,000 = 0.014 AU/day). 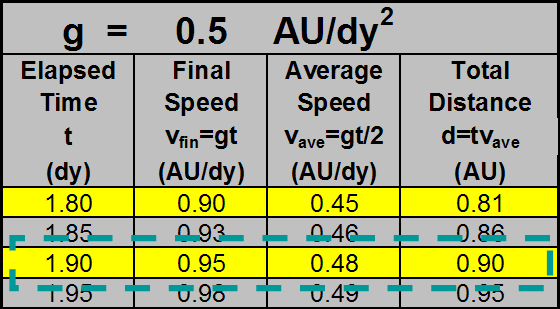 So, I think it's safe to say that the interplanetary navigator can assume 0 AUs per day as the initial speed during departure and furthermore aim for 0 AUs per day for the desired destination speed. Once at the destination, the pilot can take over and fine tune the orbital parameters. 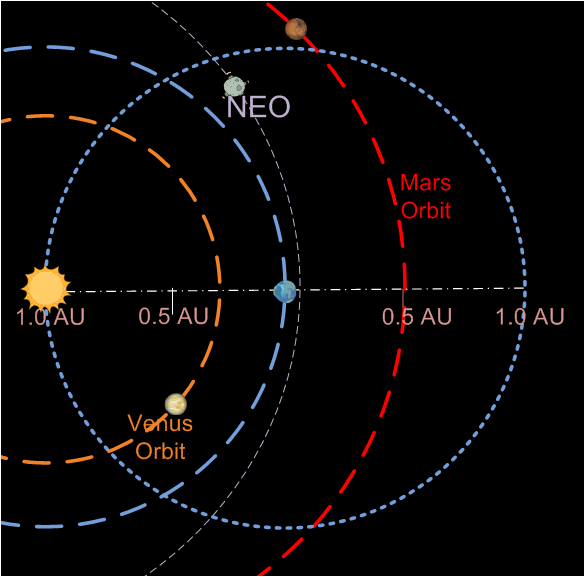 Near Earth Objects (NEOs) often come within 1 AU of Earth. A g-force vehicle which travels to these NEOs within days would be a welcome commodity.